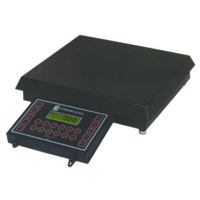 The Model SCB bench scale is easy to use, accurate and dependable. It is designed for harsh conditions and rugged use. A Model 800 or a Model 810 can be supplied. The indicator can be remote from the platform (Wall mounted)Â or mounted on a post attached to the scale platform.Â Optional Conveyor tops are available for scale platform.